New Raith Rovers signing Kevin McHattie says he cannot wait to pull on the jersey of the club he has supported since he was a boy. McHattie (22), hails from Glenrothes and is part of a Raith-supporting family - he was taken to games in his youth by his late grandfather while his uncle is a season ticket holder. The former Hearts and Kilmarnock star, who also has six Scotland Under 21 caps, previously worked under manager Gary Locke at both clubs making 93 appearances in the Premiership. The former Auchmuty High pupil had other offers on the table, but admitted he could not turn down the chance to play for his childhood heroes. “Raith Rovers are a club I’ve supported since I was a wee boy when my grandad used to take me to games,” he said. “He passed away a while ago but he’ll be looking down proud that I’ve signed for the Rovers. “I went to see my uncle Walter on Friday after I signed and he was over the moon. “Most of my pals are Rovers fans so they are all pleased as well. While McHattie has carved out a career as a professional footballer, he revealed that his old school friends may remember him more for his love of hockey. “I wasn’t into football that much when I was younger,” he said. “It was more roller hockey and ice hockey. Then I signed for Dunfermline and was there for nine years before going to Hearts and then Kilmarnock. “I’ve had a good career so far, so I’m hoping to play games here and get back on track. McHattie had one year left on his Kilmarnock contract but negotiated his release after being told he was no longer part of manager Lee Clark’s plans. “Things didn’t work out at Killie,” he said. “I was staying through there, so it’s good to be home. “I live in Pitteuchar, two minutes from the Michael Woods Centre, so it’s happy days for me. “I was always hoping to play for Raith one day. It’s come, I’m happy and now I’m looking forward to getting started. 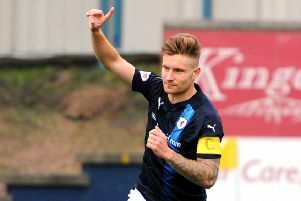 “Raith had a good season last year so it would be good to replicate that. “The boys are ambitious here and want a successful season. We’ve got the players and staff to do that.